I have been pretty busy at work but was able to get my panels cut out. 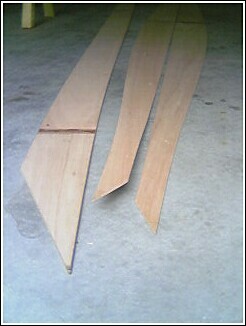 I think I am going to use sheer clamps to attach the deck. Duane does not recommend this and it will add weight, but I like the stiffness it adds to the boat and adds strength to the gunwales. I do sheer clamps too. I use cedar for them and it doesn't add much weight. My kayak was narrow enougn that I figured after adding hatches the extra stength would be a good thing. Blogger is funky sometimes; I hit the Enter key and it posted.